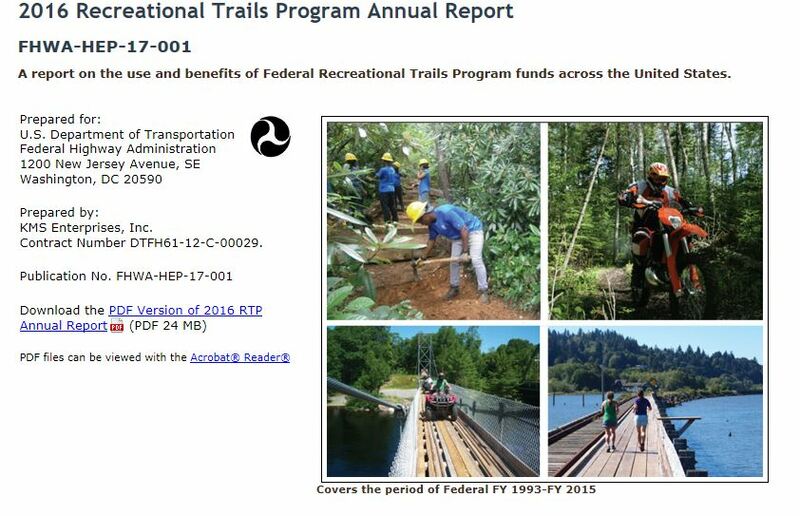 Since 1991, the Recreational Trails Program (RTP) has provided more than $1 billion in Federal funding for trails across the country. RTP grants have been an essential ingredient in creating and improving over 21,350 trail-related projects nationwide, including urban greenways, nature centers, and horse, hiking, mountain bike, and motorized trails, as well as snow and water routes. RTP leverages hundreds of millions of dollars of additional support from other sources for trails, encourages productive cooperation among trail users, and facilitates healthy outdoor recreation and economic activity in countless communities. See the RTP database for details of these projects. American Trails joins with other members of the Coalition for Recreational Trails in celebrating RTP. This federation of national and regional trail-related member organizations work together to build awareness and understanding of the Recreational Trails Program.